Would you like to be an important part of helping to protect and conserve the wild horses of the Currituck Outer Banks? Give a gift with meaning? Involve your classroom or organization in a worthwhile project? CWHF offers an exciting, personalized program supporting the CWHF mission. 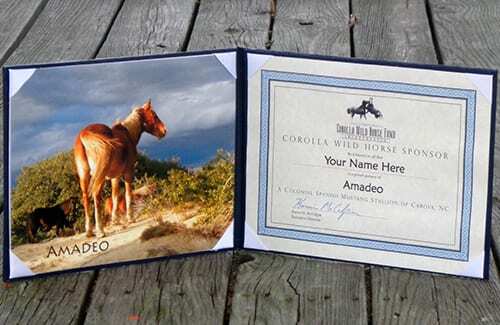 Sponsors receive a beautifully embossed 8.5×11 leatherette presentation folder, complete with a color photo of the sponsored horse, an official sponsorship certificate, and information about the horse’s life. In addition, sponsors receive updates on their horse and the efforts and activities of the Corolla Wild Horse Fund. Sponsorships are symbolic, meaning that sponsorship dollars support all horses and the CWHF mission. In addition to individual names, certificates can be made in a family, organization, or business name, e.g. “The Hansens” or “Corolla YMCA,” etc. Just let us know in the “Additional Comments” section. Do you know someone who loves horses? Perhaps a son, daughter, niece or nephew, or family? Just tell us to whom we should send the sponsorship documents, and in whose name the certificate should be made. A gift sponsorship is a great way to introduce someone to charitable giving and to the wild horses of the Outer Banks. Print the Sponsor by Mail Form and mail in your sponsorship request. Both regular and gift sponsorships can be made by mail. For just $35 for a half day or $70 for a full day, you can sponsor our Hay For A Day program and help support the horses under the Fund’s care. We spend about $25,000 a year on hay, so every little bit helps! Need Help? You can email Donor Programs, or call 252-453-8002. Horses with life-threatening injuries or illnesses are removed from the wild for veterinary attention and rehabilitation. Once removed, rescued horses are not returned to the wild. They become the responsibility of the Corolla Wild Horse Fund. Rescued horses are rehabilitated, gentled, and trained. They become available for adoption through the Corolla Wild Horse Fund’s adoption program. Luna – Rescued Mare. Originally from Dews Island, Luna has been with us since October of 2017 and has become a wonderful ambassador for her breed and for the Fund by exhibiting a propensity to learn while maintaining her gentle nature. Amadeo – Rescued Stallion. Amadeo, who had been blind in one eye, lost sight in his other eye after a fight with a rival stallion. Disoriented, he charged into the sea where he nearly died. CWHF partnered with Corolla Ocean Rescue to bring him back to shore. Rita – Rescued Mare. Rita was rescued as a foal because of contracted tendons and then adopted as a yearling to a wonderful family. Unfortunately, her adopted mother became terminally ill and in the spring of 2018 was returned to the Fund. Rita has become a vital part of our outreach program and has shown a real connection with children. Ducky – Rescued Stallion. Ducky is a seven year old stallion who came to live at the rescue farm with his harem of four mares and a yearling son in May of 2018. CWHF worked for months to keep these horses south of the northern barrier fence and have them stay in North Carolina permanently. It became necessary to remove the horses because of the start of tourist season and the worry that they would venture even farther north. Ducky is a sweet, personable stallion and becoming a wonderful ambassador for his breed. 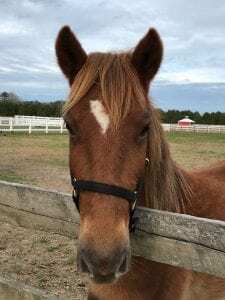 Moxie – Rescued Mare. Moxie is the oldest horse at the rescue farm. She was born in the wild and moved to Dews Island when she was a couple years old. Moxie’s mother was a mare who was appropriately named Chaos and, until now, Moxie was known as Utter Chaos. She is an independent, smart, tough mare deserving of both of her names. Moxie will live out her days on the rescue farm. She has let us domesticate her on her own terms. While Moxie will never do outreach, we will continue to share her story to highlight the rich history of these horses, and their tenacity for survival. Moxie is a Banker pony through and through and she reminds us every day how lucky we are to have these special horses in our care. Leatherette Sponsorship Folder with gold embossed CWHF logo. Click picture to enlarge. 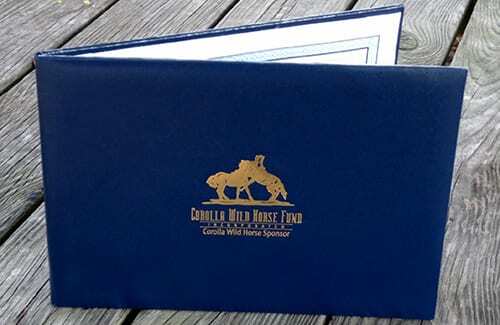 Deluxe Leatherette Presentation Folder with 8.5″ x 11″ photo of sponsored horse and CWHF sponsorship certificate. Click picture to enlarge.